From a teacher's perspective, the primary difference between our regular school year programs and our Summer Program is that we are an ever-changing collection of children, most of whom attend other schools during the rest of the year. There are other differences, such as the schedule, a wider age range, and being an entirely outdoor enterprise, but this is the one that makes what I do a bit of a different challenge. Normally, I like to let things emerge, slowly if necessary, from the children, organically, following their lead, but frankly, the Summer Program simply doesn't allow for that. By the time the kids are really getting comfortable enough to feel their oats, they're off to the rest of their warm and lazy days beyond our outdoor classroom. So, for better or worse, I find myself sometimes forcing things a bit. One of the challenges we've experienced through these first few weeks is not having enough swings, which is a situation I'll admit to having forced. We normally have two regular sings and a trapeze bar, but by the end of our most recent school year, we'd added a tire swing and a swinging rope ladder to the mix. Before our summer sessions started, I removed the the extra stuff, which is, I think, why we've had a lot of kids waiting around for their turn. During the second half of our day, we engage in what we quite unimaginatively call "Activities." Essentially, we "close" 3 of our regular stations (art, garden, and workbench) and open 3-4 new stations, from which the children, as always, are free to chose any or all. Yesterday, I introduced one of our stations by saying, "We've had a lot of people complaining about not having enough swings. Today we're going to build a new swing." If you want to work on that project, I said, you should hang out with me, naturally, near the swings. Five of our 25 or so kids chose this over making baking soda and vinegar bombs or working wooden puzzles. I said, "We're going to build a new swing. What do we need?" "Someplace up high to hang it." "Is our swing set high enough?" 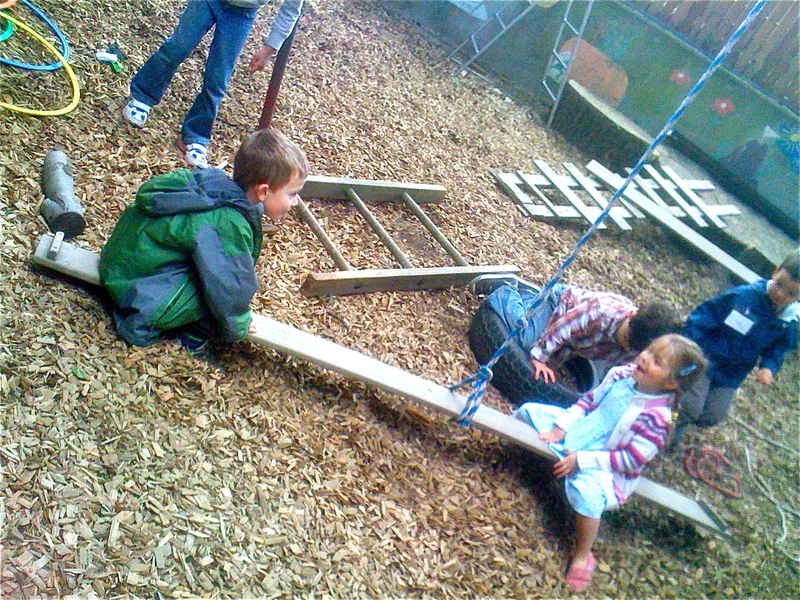 There was then a brief discussion about the merits of the swing set. As the children contributed their best thinking, I noted that our crew included one five-year-old, two four-year-olds, and two three-year-olds. Most of the younger kids had chosen puzzles, most of the older ones were working on bombs, while a certain number of all ages had gone back to the games they'd been playing when we took our break for circle time. This is why a play-based curriculum is so powerful: the children get to choose what they wanted to learn. After examining a few trees, we finally decided that the swing set would have do for hanging our new swing. "Yes, we'll probably need tools. What else?" So I forced things, "What about chains or ropes or something?" "Yes! We need chains or ropes." I asked, "Tools, chains or ropes, and a seat . . . Anything else?" After a moment of silence, "We have to get up high." "We could stand on a tree." We sat for a moment looking at the row of cedars that divides our space. "A tree is too high." We were stumped. During the regular school year, I'd have likely let it stop there, hoping it would come up again on another day, but given the special nature of summer I prompted, "I wonder if there's a tool that would get us up high." "Do we have a ladder?" I asked, suddenly realizing that the step ladder we usually lean against the fence was gone. "This is a ladder," referring to our homemade ladder which has become a sort of semi-permanent installation leading from the wood chips into the sand pit. We decided to try it. It's around 10 feet long so I was a little worried I'd actually have to climb it, but fortunately it didn't quite reach the cross bar. I said, "It's not long enough. I think there's a ladder down by the work bench." So we all went down to the workbench where we found a tall step stool. "Will this work?" "If you stand on it, Teacher Tom. I think your body is long enough to stand on it and reach." We carried the step stool together, then a couple of the older kids figured out how to set it up, which they did several feet away from the swings. I asked, "Shall I try it?" "Yes," so I climbed to the top step, then reached for the cross bar. "I can't reach it." I strained, but couldn't reach it." "We need a taller ladder." "Maybe we could move the ladder closer." I said, again steering things more than I normally would like, "I think if it was closer, I could reach it." The kids shifted the ladder into a better position. I climbed to demonstrate I could now reach the cross bar, then said, "Okay, then let's find a rope." We keep a collection of ropes in the outdoor classroom. Soon we had a half dozen options. I asked, "Which one is best?" 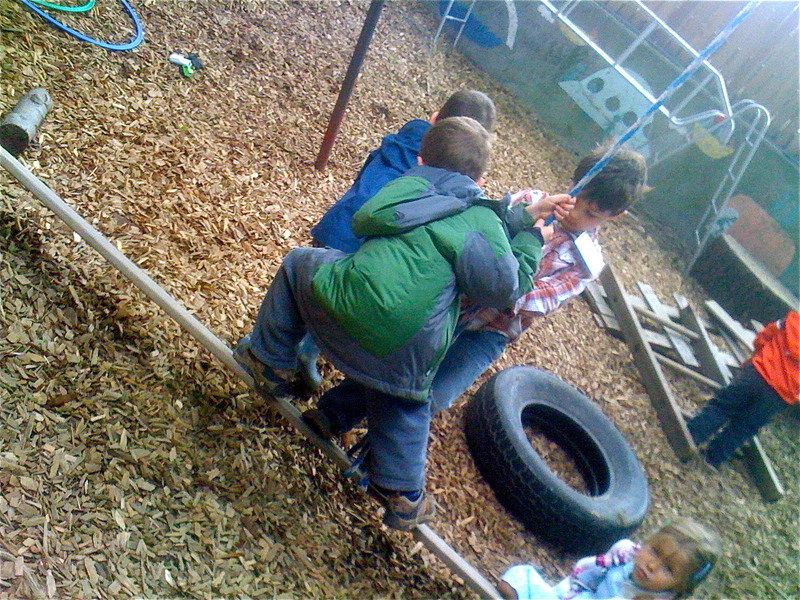 The kids started playing small games of tug-o-war to test their strength, ultimately choosing a rope that was probably the most decrepit of the bunch. 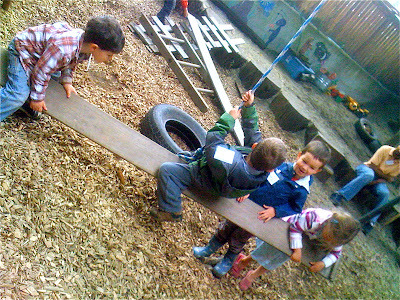 Fortunately, it is quite short, so when I hung it up, we could all readily see that we needed a longer rope, which turned out to be the very rope we'd used to hang our tire swing during the regular school year: a thick, sturdy length of rock climbing rope. I hung the rope, which dragged onto the ground. There was some discussion about it being too long, but after taking turns hanging from it to prove it was strong enough to support our weight we decided to try it anyway. I said, "Now we need a seat." We started with a log. I tied it to the end of the rope, assuming it would be unworkable. 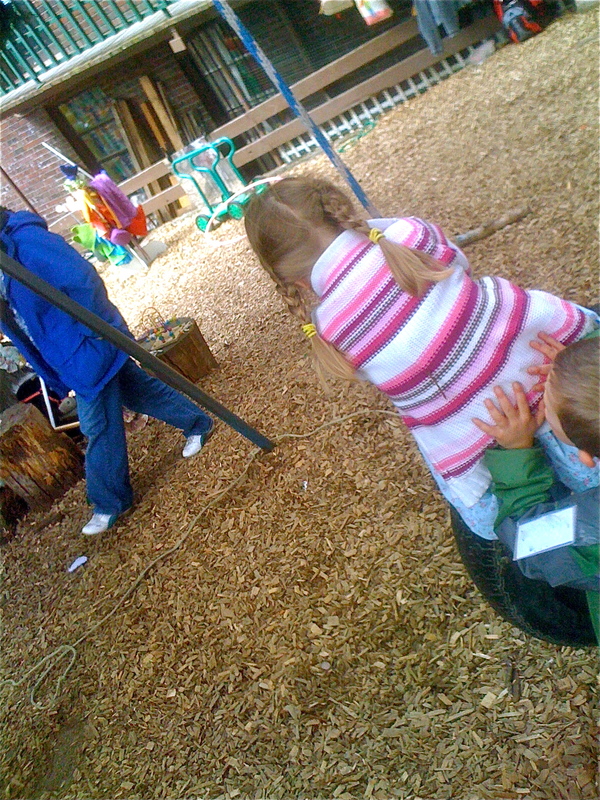 Kind of amazingly, the kids figured out a way to stand on it and sort of spin around. Each of them gave it a go, proclaiming it fun, but it really wasn't a swing. "Is this a good seat?" I asked. The kids then dragged over a long plank. I tied it onto the end of the rope. This was more fun than the log, if only because several kids could climb on it at once. After goofing around on it for a while we discovered that it had a tendency, especially with only one child on it, to lurch about rather wildly which was hazardous to standers by. 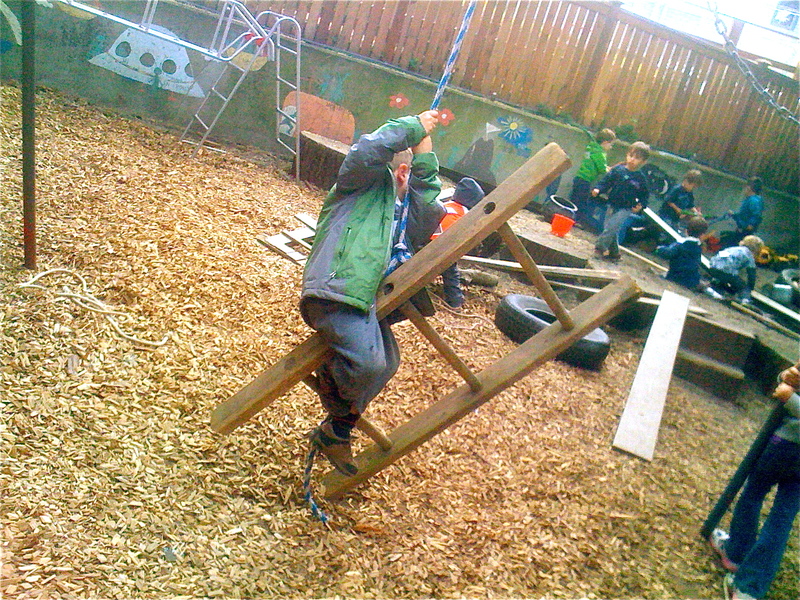 We decided it made a better teeter totter than a swing. Our next candidate for a seat was where I was anticipating us winding up, a tire, but after trying it out for a while, the kids wanted to test a couple more ideas. We tried a small board, which was about the size of a typical swing seat, but had the same challenges as we'd had with the log. By now we were starting to break up as a group. While we'd been working on our swing, one of the 2-year-olds, inspired I think by all our heavy lifting had arranged several long planks and our homemade ladder into a very precarious, yet at the same time very inviting, climbing structure that sort of cantilevered out from the tree rounds that line our raised sandpit. Before the work group broke up entirely, however, we tested one last "seat," tying a short wooden ladder to the rope. By now we were really down to two kids. They each took a turn, one feeling like it was a winner, the other convinced that someone would "get hurt very badly" if we left it up. Before removing the ladder then, I asked, "So which seat was the best?" There was a kind of shrug. I forced things one last time, "The tire?" "Yeah, nothing! Just leave the rope!"